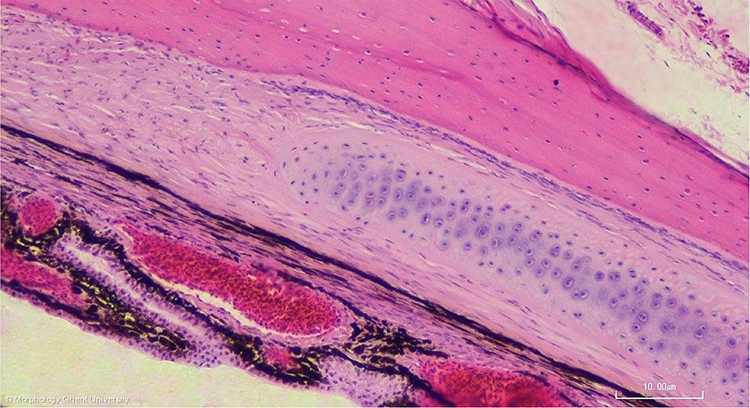 The pars caeca retinae consists of a bilayer of cells: a pigment cell layer (stratum pigmentosum retinae) and a layer of non-sensitive columnar cells. The pars caeca retinae continues further over the ciliary body as the pars ciliaris retinae and over the iris as the pars iridica retinae. Anterior to the ora serrata, the choroid continues as the stroma of the ciliary body and iris; the sclera is continuous with the cornea through the scleral plate. In this zone, the scleral cartilage terminates internally to the scleral plate.